Has Rodgers Lost the Plot? Four games into the season and Liverpool supporters around the globe have collectively hit the panic button. Going into the season, I had blogged that the club needed a strong start to these first four games to help kick-start what appears to be a challenging fall ahead. Results matter most, so on the surface everyone was happy with seven points out of nine in the first three matches. Skeptics go back to all three matches and talk about the poor play and fortunate refereeing that helped disguise the victories. The 0-0 draw at Arsenal was a clear high point for the club, with only two world-beating Cech saves keeping Liverpool from stealing all three points at the Emirates. Just win that home game against West Ham and go into the international break near the top of the table. Not so fast. We all know what happens next. After analyzing the West Ham match followed by the multitude of loan activity as the transfer window deadline approached, that’s the first time I have allowed that question to enter my mind. Before looking at the West Ham match, I recall the Arsenal draw. Personally I thought it was a genius move to recall Lucas into the roster and kill off rumors of his departure to Serie A. With a gauntlet of away fixtures all autumn long, having a strong defensive midfielder like Lucas at your disposal gives you options in those challenging environments. His inclusion at the Emirates helped stabilize the midfield in the first half as Liverpool dominated play. When he lost his legs early in the second half and got subbed off, Arsenal took clear control of the match and could’ve won the match. I don’t have my coaching badges and I don’t see what is going on at Melwood, but I hardly think I was alone in thinking Rodgers would alter the starting XI before the West Ham match. While using Lucas in the roster to solidify the middle helps defensively, it comes at the expense of a more creative attack-minded player like Jordon Ibe or Danny Ings. What I thought to be a genius move at the Emirates would be considered an idiotic move at home against a mid-table team like West Ham. Many people speculated that the terrible finish to last season was the death knell of Brendan Rodgers as manager for the club. He retained his job, but certainly Rodgers has to realize that he’s on his last legs as manager. If you believed that you were on your last-ditch effort to retain employment, wouldn’t you want to have every possible resource at your disposal? If Rodgers fails this coming season, he is clearly out of a job. So why would he benefit to ship off any player on loan? It makes little sense to me. If Lazar Markovic can help you win a tough road match at Rubin Kazan and help you advance to the Europa League, why not keep him at Melwood? What do you care about his professional development as a player by getting more playing time in Turkey if you end up coaching some pub team in the Blue Square conference next season? The only theory that I can come up with is that FSG mandated an internal salary cap for Rodgers. In order to remain compliant within UEFA’s Fair Play rules, they know exactly what the wage bill needs to be and remain compliant. When a player goes out on loan, both clubs end up sharing a portion of that player’s salary. While Liverpool probably end up paying most of Mario Balotelli’s wages while he returns to Milan this season, it stands to reason that Fenerbahce will be paying more for Markovic’s services. If I am correct and Rodgers needed to trim his roster like a varsity high school soccer coach, then I guess I could understand why players like Ilori and Markovic are shipped off temporarily. Is it really worth paying their full salary for what likely will amount to less than a dozen games all year? Maybe not. Even though I sort of understand the excessive loan situation, it’s not as bad as you might think. Chelsea currently have 25 players on their 1st team roster, and credit 33 players out on loan. They have enough talent playing for other clubs that they could probably field a team in the Championship and earn promotion to next year’s Premier League. That’s no joke. So the fact that Liverpool has 14 players out on loan is not that worrisome to me. Most of those players are young enough to think that Liverpool is their future. Yet the question remains, “Has Rodgers lost the plot?” I don’t think so. The mass exodus of loaned players at the deadline suggest something larger is at stake. I’m still uncertain that Rodgers may not have the respect of the players, nor does he have the tactical adaptability to conjure up a win from nowhere. Great managers seem to figure out how to win games that their outplayed clubs had no business being in. I’m not sure the surprising wins and successes come from Rodger’s genius as they do short moments of brilliance from some great players. Rodgers is definitely a good manager, but can he be great? 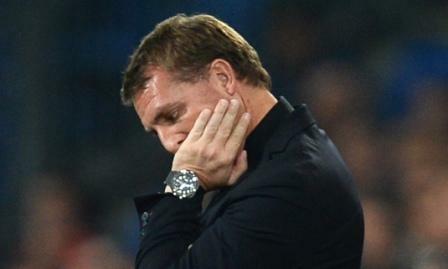 Time will tell as Rodgers remains the bookmakers’ favorite to be the first manager sacked. I don’t know that he has “lost the plot” as much as I am starting to believe that he is not the guy that can be successful giving the constraints laid out by FSG. If you can’t blame Rodgers, then you must blame FSG, right? Quite frankly there’s nothing you can do about it anyway. It’s certainly frustrating as a fan, but there’s always the MLS. You know what, though? Results matter. Beat Manchester United on September 12th and all of this will be moot. Three points at Old Trafford and all will be right with the world again. There will be much rejoicing. And as we all know in this sport, anything is possible over 90 minutes. So get on down to the pub to join your fellow Reds cheer the team onto victory!! ← Was It Really Good Business? One Response to Has Rodgers Lost the Plot? LFC has allowed three goals in four matches. (0.75 per match) Chelsea was the best defensive team in the league last year and allowed 32 goals in 38 matches. (0.84 per match) It is certainly too early to project that across an entire 38-game season, but that includes a clean sheet away to Arsenal that no one expected and only the Manchester clubs have fewer goals allowed. Arsenal is the only other club with 3 conceded so 16 other clubs have allowed more goals. (Sure, there’s an asterisk for a wrongly disallowed Arsenal goal but I’m guessing that won’t be the only wrongly disallowed goal of the season and even if you factor that in the defensive record is better than most people would have guessed through four matches.) Perhaps the frail nature of the defense was exposed against West Ham, but overall through 360 minutes the results have actually surpassed most expectations. Again, it’s much too early to draw any conclusions from “on pace” calculations, but for what it is worth, LFC is on pace for 66.5 points and, while subpar by our historical standards, that would be good for 5th place in the league most years. Keeping in mind all the new faces and the fact that we have been dealt the anomaly of having to play away fixtures in the first half of the season against the five clubs that finished in the top five last season, if we can stay the course and be on pace to finish 5th by New Year’s we’re in great shape. If there’s any hope to claw back into the top four that will be decided in the spring after the new faces have had time to gain some chemistry and when the toughest fixtures will be at Anfield. Of course there’s a glass-half-empty side to acknowledge as well. While goals allowed and total points are better than the media would have me believe this week, the fact that only two goals have been scored in four matches – and one of those should have been disallowed – is a growing and legitimate concern. The tactics look legitimately questionable and all the critics of the Benteke signing look rather justified in their complaints. The fact that it took Balotelli all of three minutes to score in his AC Milan debut (and he added two assists) rubs a little salt in the wound and doesn’t look good for Rodgers either. There’s still time to sort it out, but the news of another delay in Sturridge’s return doesn’t help. To borrow from Rick Pitino, “Luis Suarez isn’t walking through that door” so somebody needs to step up, whether it’s through pure talent on the pitch or more creative tactics.